•Force Retry - this will tell VPOP3 to retry sending the messages the next time it connects to send messages. Normally VPOP3 will wait between retries depending on rules configured in the Mail Sender, this option will override that delay. Note that VPOP3 will only retry sending the message to any recipients who have not accepted the message or rejected the message permanently. •Hold - this will mark the messages as held. That means that the messages will still stay in the Outqueue, but VPOP3 will not attempt to send them. 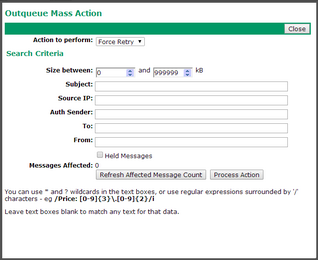 You may unhold the messages later either individually on the main Outqueue page, or through further bulk actions. •Hold - if this is checked, then only held messages will be processed (if they match the other conditions). If not checked, then only unheld messages will be processed. The Messages Affected count will tell you how many messages will be affected by the current conditions at this moment. The Refresh Affected Message Count button will tell VPOP3 to recalculate how many messages will be affected. This may be useful if more messages are arriving or being sent, or the conditions are changed. The Process Action button will tell VPOP3 to process the selected action on the chosen messages. This will report the number of items affected after the action is complete. Note that this count may be different from the Messages Affected count because more messages may have arrived since that was calculated. 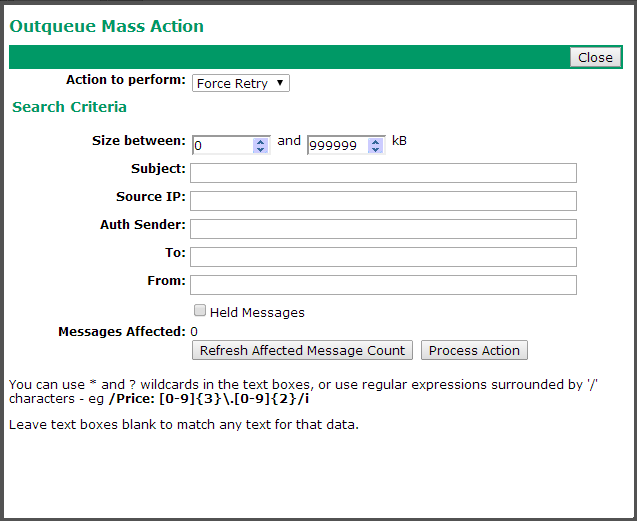 Also, note that for the Force Retry action, the result count shows the number of target recipients affected, not the number of messages, so if messages are sent to more than one recipient who needed retrying, the resulting count may be larger than expected.